Canine Health Concern was formed in 1994 by Catherine O’Driscoll, after two of her beautiful young Golden Retrievers – Oliver and Prudence – tragically died. She asked, ‘why?’, and the answers that came back were sufficiently disturbing to make her feel that independent research was necessary – free from commercial bias. Catherine was sent scientific papers which told her that commercial pet food was nutritionally inadequate, and that many deficiency diseases are the direct result of poor feeding. 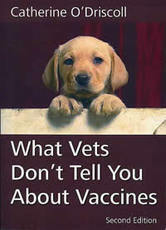 She also learnt that the annual shots we give to our pets each year, in the belief that we are protecting them from disease, are actually the largest cause of ill health in our pets today. CHC advocates real food for dogs. That is, food that Mother Nature has designed, over millions of years, and which has made the species thrive for millions of years. Members of CHC who have reverted to a CHC-recommended natural diet have seen illnesses disappear and vet bills plummet. Our diet survey showed an 85 per cent drop in the number of veterinary visits once dogs were changed to real food.